Installation art! Two separate metal, flower-shaped pieces move with the wind to create a mesmerizing masterpiece in your garden or landscape. 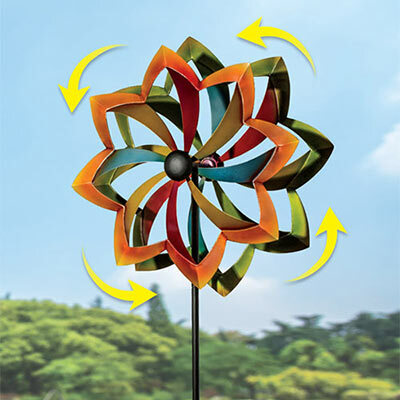 This Large Dual Motion Wind Spinner is large enough to make a statement, it's also durable and built to last! Sturdy 3-pronged stake keeps it in place. 19"w, 59"h. Hurry! Quantities are limited!